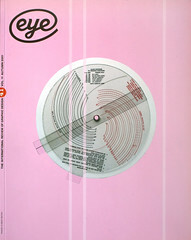 Eye Magazine | Review | Who knows where the time flows? Who knows where the time flows? The latest in the stream of books authored by Steven Heller is useful (and not only to students) in order to point out that there was life on earth before 1980 and David Carson (b.1956). However, the index is oddly selective, while readers may find it irritatingly North-Americocentric: Nipper, the dog who pricked up his ears to hear the tones of his late master’s voice goes unmentioned, while Francis Barraud’s client appears as Victor, rather than the then (Typewriter and) Gramophone Company. The century since 1890 is punctuated by tombstone quotations to mark the decades, but Gerald Holtom’s 1960s ‘Peace’ button (1958) is put back to 1954. Heller’s linear time-line continuum is, happily, subverted on the cover, which presents it as a spiral, the designer James Victore reminding us of the cyclical nature of fashion and styles, which are Heller’s stock-in-trade.